Dear Friends, last Sunday February 21 both adults and kids took part in the Amateur Chess Tournament, organized in cooperation between Azerbaijan Center, Houston-Baku Sister City association and Houston Azerbaijanis. This was the 3d annual tournament and we were happy to see there were a lot of participants this year also. We encourage everyone who did not win a prize or did not go at all participate the next year! Special thanks to Ilgar Azizov, Eldar Guliyev (Houston Azerbaijanis) and Farid Mammadov (Azerbaijan Center). After a full day of the Oil and Gas Conference “Southern Gas Corridor” that took place in the University of Houston, all the guests proceeded to Zaza hotel where on November, 9th, 2015, the Azerbaijan Center hosted a reception honoring Azerbaijan National Flag Day. It has become an annual tradition to celebrate Flag Day in Houston, Texas. The event gathered the Houston-Azerbaijani community as well as state and city officials to express respect to this meaningful national holiday of Azerbaijan. The welcoming remarks as well as the insight in the history of the holiday and its significance to Azerbaijan Nation were done by the President of HBSCA and CEO of Azerbaijan Center Irada Akhoundova followed by the speech of Ambassador of Azerbaijan to the US Elin Suleymanov in which he extended his appreciation of Ms.Akhoundova’s work and pointed out the significance of the role of Azerbaijan Center in Houston in continuous development of the relationship between Azerbaijan and Texas. Secretary of State of Texas, Carlos Cascos, expressed how delighted he was to be present at such event pointing out that this was the first event to honor the National Flag that he had a pleasure to attend. Secretary Cascos also emphasized his wish to visit the country of Azerbaijan to learn more about its culture and traditions. To conclude, Secretary of State delivered a message from the Governor of Texas, Greg Abbott, in the form of a congratulatory letter encouraging all Texans to embrace diversity and extended his appreciation for many contributions of the Azerbaijani community to Texas. Among distinguished guests was a representative from the Department of Trade and International Affairs, office of the Mayor of City of Houston – Nike Luqman, Consular Affairs and International Partnerships Manager. Ms. Luqman presented a Proclamation issued by the Mayor of Houston honoring Azerbaijan National Flag Day. Houston Iftar dinner 2014 with the Mayor of Houston was a success! The 4th Annual Houston Iftar Ramadan Dinner with Mayor Annise Parker showed, this year again, a beautiful portrait of Brotherhood where all races and religions shared and enjoyed peacefully under one roof. On Saturday, June 12th 2014, Iftar gathered together several communities with members of all faiths and denominations to break the daily fast during this prestigious dinner at the Bayou City Events Center. During Ramadan, Muslims request forgiveness for sins in the past, pray for direction and assistance in abstaining from everyday troubles, and endeavor to cleanse themselves through self-control and great acts of faith. Almost 2000 people attended this meaningful event organized by the Baku, Abu Dhabi, Istanbul and Karachi Houston Sister Cities Associations and hosted by collaborating organizations such as the Azerbaijan Center, Raindrop Turkish House, the Islamic Society of Greater Houston, His Highness the Aga Khan Council for the Southwestern United States, the Pakistan Chamber of Commerce-USA, the National US-Arab Chamber of Commerce, Interfaith Ministries for Greater Houston, the Council on American Islamic Relations Texas Chapter, the Hashoo Foundation, and many others! The Mayor of Houston and other Congressional, County, City, business, civic leaders and Members of Consular Corps of Houston also attended the multi-cultural event to show their support and solidarity. After being introduced by Aftab Ghesani, President of His Highness the Aga Khan Council for Southwestern United States, Mayor Annise Parker highlighted the importance of solidarity and diversity as foundations of the City of Houston while addressing the full banquet hall. The Mayor also made emphasis on the wonderful work that all Sister Cities are able to accomplish together. The Mayor of Houston was joined by a Guest of Honor, S. Javaid Anwar, President and CEO of Midland Energy. Congresswoman Sheila Jackson Lee and Congressman Al Green, both congressional representatives whose districts are located in Houston, also greeted the audience and presented proclamations to the organizers of the dinner for their hard work towards creating a more diverse and bonded society. All the volunteers at this event were a perfect representation of diversity and unity! The Azerbaijani community together with the Pakistani, Turkish, Arab, and American communities were all proud to be a part of this symbolic event and look forward to the next ones to come. On behalf of the Organizing Committee of Houston Iftar 2014, we would like to express our sincere gratitude to all the volunteers and participating organizations for their strong support! Registration is a MUST on a first-come, first-served basis. Event & Parking are FREE. Ramadan is the ninth month of the Islamic calendar; Muslims worldwide observe this as a month of fasting.This annual observance is regarded as one of the Five Pillars of Islam.The month lasts 29-30 days based on the visual sightings of the crescent moon. This year, Ramadan will start in June 28th and finish on July 28th. During Ramadan, Muslims request forgiveness for sins in the past, pray for direction and assistance in abstaining from everyday troubles, and endeavor to cleanse themselves through self-control and great acts of faith. On the occasion of Houston-Baku Sister City Association, Council Member Jarvis Johnson presented a proclamation before council recognizing Houston-Baku Sister for fostering the continuous successful interchange of culture and ideas between Baku and the Houston Community through the diligent work of volunteers. 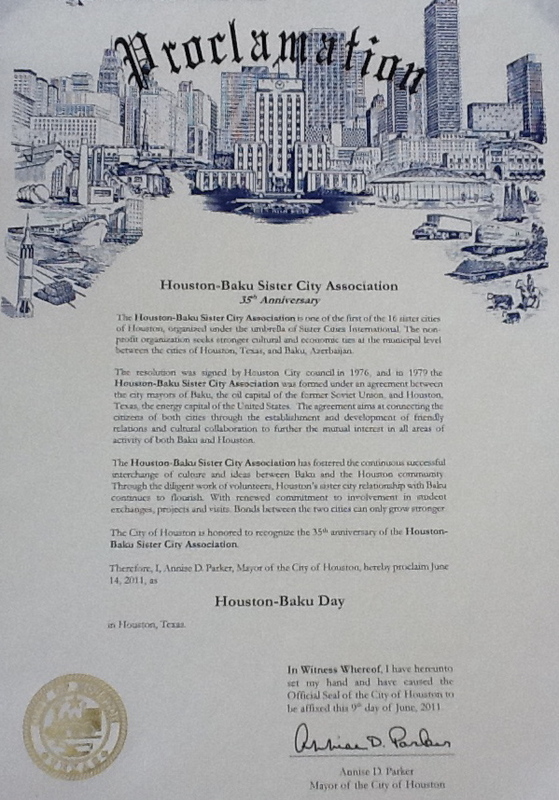 In honor of this, Mayor Annise Parker proclaimed June 14, 2011 as Houston-Baku Day. During the last weekend of April and first weekend of May 2011, Houston International Festival celebrated the culture and traditions of the Silk Road countries. In collaboration with the Azerbaijan Ministry of Culture and Tourism and the IFEST hosts, HBSCA proudly presented unforgettable performances at the festival delivered by the Azerbaijan State Folk Dance Ensemble during the weekend of May 7/8. Happy Novruz! Novruz Bayramı is the Azeri holiday that celebrates the new year and coming of spring. On March 19, 2011 the Houston-Baku Sister City Association hosted a wonderful reception to celebrate the holiday. A fabulous time was had by all!